A: All Gulf Beach Rentals properties are set up for normal housekeeping. However, the properties will NOT have paper towels, bathroom tissue, soap, or cleaning products. This brief checklist includes some helpful suggestions to assist you with your packing and shopping. Keep in mind that we do offer grocery service for a fee. Q: Can I bring the family pet? A: Unfortunately most of our properties are NOT pet friendly. This is generally mandated by the home owners association. Q: Can we grill out on our balcony? A: Unless your condo is equipped with a built in gas grill, the answer is No. Use of outdoor grills on decks, porches, balconies and underneath houses is prohibited. Grills are sometimes provided in common areas at condominiums, however we cannot guarantee their working order or availability. Q: When do I check in and check out? A: Check in time is 4pm at all properties. Check out time is 10am. Q: What furnishings do properties include? Q: What are our departure responsibilities? A: Please strip all beds, run the dishwasher, and remove all trash from the property and place it in the dumpster or trash chute. Q: What if there is a hurricane or tropical storm? A: Be advised Gulf Beach Rentals’ cancelation policy does not provide refunds for unforeseen developments such as illnesses, mandatory hurricane evacuations or similar events that can affect your trip. We strongly recommend that you purchase Trip Insurance. Guests purchasing Trip Insurance may qualify for a full refund through CSA Travel Protection. For more information please email or call 800.213.9544. Note: Cancellations, date and property changes occurring less than the minimum days required notice (30 days for condominiums, 60 days for houses, 90 days for 6-bedroom or larger house rentals and 90 days for monthly rentals) will result in forfeiture of initial reservation payment, rent, taxes and fees – no exceptions. Q: Does my vacation property have internet access? A: All of our properties provide broadband Internet access, either fee-based or free, through their individual service providers. Internet service, if provided, cannot be guaranteed. Check with your reservation specialist for details. However, we cannot make any representations of the quality, speed or security of these connections. Q: Is there a maximum number of vehicles allowed at a property? A: CONDOMINIUMS: No more than 2 vehicles are allowed at any of our properties. If you have a 3rd car, you will need to make arrangements to park it somewhere else. : When do I pay my Initial Reservation Payment? A: Your initial reservation payment is payable via MasterCard, VISA, Discover at reservation time. “Check-by-Phone” is also available. Q: What happens if there is inclement weather or if I decide to leave early? A: There are no refunds for early departure due to inclement weather or personal circumstance unless you purchased trip insurance and it is a covered event. Call CSA Travel Protection 866.298.6846 or Click Here for details. Q: Do you provide cribs or highchairs? A: No, but Portacribs, baby beds and high chairs are available for a rental fee from local businesses. Note: Portacrib & baby bed sheets are not furnished. Q: Can I bring my jet skies, boat, or RV? A: Of course you can. However, these items, and the trailers that carry them are prohibited from parking on property. You will need to make arrangements to park trailers and/or RV's elsewhere. Cancelations, dates and property changes occurring less than stated minimum days required notice will result in forfeiture of Initial Reservation Payment, rent, taxes and fees. A: Yes. After choosing a property and checking availability, click the “Book It” button and follow those easy steps. Q: When is final payment due? A: Final payment (balance due after Initial Reservation Payment has been paid) is required 30-60 days prior to arrival. Payment may be made by MasterCard, VISA, or Discover. "Check-by-Phone" is also available. A: No, but you can purchase it online through one of the many travel insurance providers. Q: Can I view properties online? A: Yes, go to the Vacation Rental Search portion of Gulfbeachrentals.co and search by available dates, property type, gulf orientation, etc. There are photos of the properties and some have virtual tours showing the interior details of that property. Q: Can I view properties in person? A: Due to liability reasons, keys cannot be released to prospective guests to view property; however, interior photos and virtual tours may be viewed online. Q: Can I make long-distance phone calls from the rental property? A: If the unit has a landline phone, local calls are free. To make a long distance call you will need to use a calling card, call collect, or use your cell. Q: Can I cancel online? A: If you must cancel, change dates or change properties please call us (251.500.0596) or email us ([email protected]) as soon as possible. We require a 30-60 day notice for condos and 60-day notice for houses prior to arrival for your initial reservation payment to be refunded or transferred. Cancellations are subject to a cancellation fee. Monthly rentals and 6-bedroom or larger house rentals require a 90-day notice of cancelation, date change or property change. Cancelations or changes occurring within less than stated notice will cause your INITIAL RESERVATION PAYMENT to be forfeited. No refunds for early departure. Q: How do I report a lost item? A: Call us at 251.500.0596 to report an item left behind when you departed one of our properties. We are not responsible for items left in properties; however, if items are located we will return them to you and take the cost of postage out of your security deposit. Q: Can I send/receive a fax or make a photocopy during my vacation? A: There are photocopiers and fax machines at the local UPS stores. Q: Are there any handicapped accessible properties? A: None of our properties are SPECIFICALLY accessible. However, depending on your needs we may be able to accomodate you. A: Yes, our beautiful Gulf Coast beach communities stretch from the southern end of Alabama into the western edge of Florida. 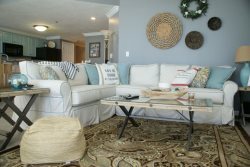 Discover our unique vacation condos in Gulf Shores and Orange Beach in Alabama. Q: How far is the Gulf Shores area from the airport? A: Pensacola Gulf Coast Regional Airport is approximately a 45-minute drive and Mobile Regional Airport is approximately a one-hour drive. See driving directions. Q: What transportation is available when I arrive? A: You may wish to contact any of the taxi services that operate in our area. Q: What special events occur in the Gulf Coast area, and when? Keep updated on events with our Gulf Shore/Orange Beach Calendar of Events. Q: What family activities are available? And there's much more: championship golf courses, inshore and deep sea fishing, dolphin cruises, parasailing, diving adventures, bike rentals, nature & birding trails, and kayak/canoe/stand-up paddling excursions. Q: What non-beach activities can I enjoy for low cost or free? Q: What types of restaurants are on the Alabama/Florida Gulf Coast and where is the best place to eat seafood? A: Fresh seafood (as well as a long list of other culinary delicacies). served in a relaxed setting, is the norm for our area. It's impossible to declare where the best seafood can be found, but we are sure you will decide on your own as you try out these restaurant choices. Q: What is the nightlife like on the Alabama/Florida Gulf Coast? A: A wide variety of coastal entertainment venues exist in our laid-back, music-oriented destination. Find out who is playing where during your stay - go to www.orangebeach.ws or gulfshores.com for entertainment calendars. Q: Where can I go to play golf? A: Our area is sometimes called "golf shores” because of the abundance and variety of golf courses that are sure to delight golfers of all ages and skill levels. Q: Besides the TV in our rental property, where can we go to watch sports? A: Local venues where patrons watch their favorite sports include The Hangout, Live Bait, Tacky Jack's, Lester's, Rafters Restaurant and Sports Bar, Papa Roccos Oyster Bar and Pizzeria, Hooters, Mud Bugs Pub & Club, Pink Pony Pub and more. Q: Where can I go to fish? A: Inshore fishing, pier fishing and deep-sea fishing are king on our coast, and one look at the long list of possibilities will explain why. Q: How do I get a fishing report? A: Read the area's saltwater fishing report. Q: Where can I launch my boat? Located on the south side of the Intracoastal Waterway on West Canal Drive, directly under the W.C. Holmes Bridge (the Highway 59 bridge crossing the Intracoastal Waterway). This is a well-maintained boat launch with a large, paved parking lot. Located on the north side of Little Lagoon, across the street from Doc's RV Park (17595 Fort Morgan Road). Located on Cotton Bayou, north of the Beach Highway and just east of Highway 161 (near Rite-Aide). There are 2 ramps. Due to popularity, parking may be crowded. Located at the end of Marina Road, east of Highway 161. This newly renovated launch is within view of the Alabama Point pass. Due to popularity, parking may be crowded. Q: Are vehicles allowed on the beach? A: Only emergency vehicles are allowed to drive on the beach. Q: Can we build a fire on the beach? A: Building a fire on the beach is not allowed. Q: Are fireworks allowed on the beach? A: The use of fireworks on the beach is not allowed. Q: Are there lifeguards at the beach? A: In Gulf Shores and Orange Beach lifeguards patrol the public beaches only. Q: What do the beach flags mean? Always take note of flags flying on public beach areas before entering the water. Below are the flag explanations. For tide information, call 251-968-TIDE. GREEN FLAG - Conditions are calm. YELLOW FLAG - Moderate surf and/or currents. DOUBLE RED FLAGS - The surf and currents are so rough that the water is closed to the public. PURPLE FLAG - Dangerous marine life present (sharks, jellyfish, Portuguese man-of-war, skates, etc.). Q: What are rip currents? A: Rip currents are channelized currents of water that pull people away from shore. If caught in a rip current, stay calm. Rather than swimming directly toward the shore, swim parallel to the beach. Once free of the current, swim at an angle, away from the current, toward the shore. Q: Can I pick the sea oats? A: Sea oats are vital vegetation that anchors and stabilizes sand dunes and prevents dune erosion. Wild sea oats is a protected species; picking sea oats or harvesting the seeds is against the law. Q: Can I walk on the sand dunes? A: Sand dunes play a major role in protecting our white, sandy beaches. The daily rise and fall of the tides and windy weather continually change the profile of the beaches, and sand dunes help to naturally replenish them. The sand dunes are also habitats for sea turtle eggs, sand crabs, and other marine creatures. Please use dune walks, boardwalks and other designated paths to the water, and never walk through the dune system. Q: How can we protect nesting sea turtles? A: Three species of nesting sea turtles call our area home. These endangered and threatened species are protected by law. Please do not disturb the turtles or their nests. To keep the hatchlings' path clear, remove all beach equipment and trash. Turn off outside lights and shield indoor lights from shining onto the beach at night. Avoid using flashlights or flash photography. Q: What are the benefits of renting a condo or beach house rather than a hotel room? A: Space and savings top the list of reasons condo and beach house rentals are so attractive; you can pay 50% less per square foot and you can share that cost with family and friends. In addition to your private bedrooms and baths, the bonus is a private balcony or deck usually overlooking the gulf or other body of water, a living/dining area and a fully equipped kitchen. Q: How do I choose the ideal Gulf Beach Rentals property? A: Finding the best property for your vacation needs is simple when you use the online search on our home page. Specify your preferred dates, size property or number you need to accommodate, price range, beach area, view, amenities, etc., and your results will include details, photos, virtual tours and price quotes for each property. Q: What do I pack? Q: What is considered "in season” and "off season”? A: Typically Memorial Day to Labor Day is the primary season for our beach resort area. Reduced vacation rates are available generally from September (after Labor Day) thru mid-May. A: At this time we do not have any pet friendly properties. We are actively adding more properties and if the property is pet friendly, we will make sure to note it in our advanced search section. Q: Do keys have to be returned to the office? A: Most of our properties have KABA locks and you will be issued a code for entry. For those without electronic locks, keys will be either in a lock box or picked up on site. Q: How can I get an extra parking pass? A: Parking space is limited at condo buildings as regulated by the Homeowner Association Board. Each property is limited to 2 cars. Q: Can I arrange for beach chairs and baby beds prior to arrival? A: We do not supply baby beds, beach chairs, umbrellas, etc. You can make prior arrangement with the beach service and equipment rental companies for these items.